I’m thrilled to announce that my new book Striding Around Ross is now available for sale. To get one of the first signed copies please go right now to The Ross Round walk page. 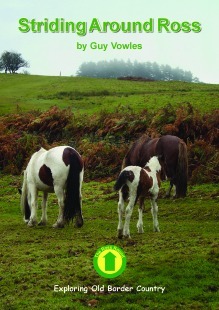 Those of you who know me or are well travelled Herefordshire walkers might have heard of the Ross Round. Well, I have know added an extra loop to create the Ultimate Ross Round, a 26 mile walk around the beautiful Ross on Wye area. A comprehensive illustrated guide to the book has now been published and is called Striding Around Ross. The book will be officially launched on March 27th at Rossiter Books in Ross on Wye and is now available for sale here at only £5.99 with free P&P. Although the title is different to my initial Ross Round, Striding Around Ross still includes the original Ross Round (ORR) but it now also has an extra optional loop that makes the new ultimate Ross Round (URR) a marathon distance. There is also a new shorter loop called The Loughpool Loop and this together, with the other additions, mean that there is now around (excuse the pun!) 50 miles of walking described in the new book. The book is in full colour with detailed maps and many photographs.At 56 pages it is nearly double the size of the previous Ross Round book but will still sell at only £5.99 with free P&P.